Last October, the Lynx joined the Houston Comets as the only four-time champions in WNBA history. The Lynx began their drive for five with some key offseason moves to help bolster their already enviable roster. 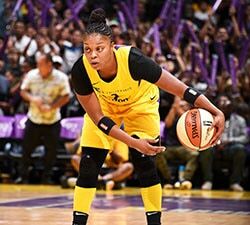 Head coach Cheryl Reeve was signed to a multi-year extension, veteran forward Rebekkah Brunson (the only five-time champion in league history) re-signed and veteran free agents Tanisha Wright and Lynetta Kizer were added to a roster firmly in win-now mode. 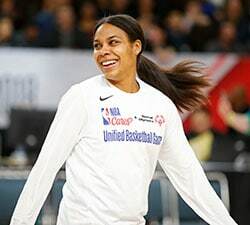 The Lynx had the oldest roster in the league last season and lost two of their younger players this offseason, as backup guard Renee Montgomery signed with Atlanta and forward Natasha Howard was traded to Seattle. That wasn’t the only significant trade the Lynx pulled off; with Montgomery out, the Lynx acquired former All-Star guard Danielle Robinson from Phoenix in exchange for Minnesota’s first round pick (No. 12 overall). Minnesota will be the last team to make a selection in the draft, with the first of their three picks coming in the middle of the second round at No. 17 overall. The defending champs also hold the final pick in the second and third rounds (Nos. 24 and 36). Talking draft strategy for the Lynx is difficult, as traditionally the odds have been stacked against any player they select to become a steady contributor or make the 12-woman roster. But at the same time, the Lynx have to infuse some young talent to their veteran core. Lindsay Whalen and Brunson are entering their 15th seasons in the WNBA, with Seimone Augustus and Wright entering year 13 and reigning MVP Sylvia Fowles entering her 11th. Even a younger player like Maya Moore, 28, has a lot of miles on her legs; deep playoff runs are great, but they make an already limited offseason even shorter for players. Reeve has a balancing act on her hands of milking everything she can out of a championship core and building for the future of the franchise. That way, there won’t be a massive drop-off once some of the core players call it a career. Of course, it’s a question any coach would be happy to ponder: What am I going to do with all this talent and all these championships? The Lynx have been the model of consistency this decade with seven 20-plus win seasons, six Finals appearances and four championships. And they are on the precipice of standing alone in the record books as they enter 2018. Do the vets have enough left in the tank for one more magical run? Will a younger player emerge to help bridge the team from its present greatness to future success? The Lynx have three picks to try to find a diamond in the rough. Whoever they bring in will have incredible veterans beside them, a championship culture to learn from, and a difficult task ahead of them come training camp. 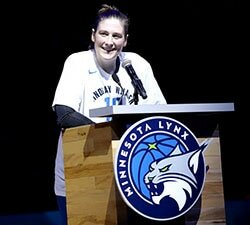 It’s difficult to make any WNBA roster, but breaking into the Lynx may be the most daunting of them all.